Author of Balkan Ghosts, Robert D. Kaplan now travels from West Africa to Southeast Asia to report on a world of disintegrating nation-states, warring nationalities, metastasizing populations, and dwindling resources. He emerges with a gritty tour de force of travel writing and political journalism. Whether he is walking through a shantytown in the Ivory Coast or a death camp in Cambodia, talking with refugees, border guards, or Iranian revolutionaries, Kaplan travels under the most arduous conditions and purveys the most startling truths. 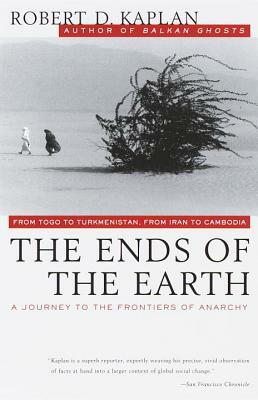 Intimate and intrepid, erudite and visceral, The Ends of the Earth is an unflinching look at the places and peoples that will make tomorrow's headlines--and the history of the next millennium.